St. LOUIS MARIE GRIGNION De MONTFORT, the founder of the Montfort Brothers of St.Gabriel, was a great visionary who lived in France during the 17th & 18th centuries. He used education as a tool to improve the life of the masses. To continue this noble mission, in 1705 he founded the Religious Congregation of the Brothers of St. Gabriel. In 1903, three Missionary Brothers from France came to India and began the Montfortian Education Mission. Their zeal, hard work and commitment bore much fruit. Today there are about 600 committed Montfort Brothers spread all over the country serving in more than 155 educational institutions and Social Action Centers throughout India. 1 March 2006 was a historic day on which more than 2500 people expressed their confidence in the Montfort Brothers by registering and expressing their willingness to entrust their wards to the care of the Brothers in the upcoming school. This happened under the thatched roof, when a few concrete pillars were the only signs of the school to be established. Dispelling all doubts and misconceptions the first phase of Montfort School was built in less than six months time; on June 19th 2006, Montfort School – CBSE affiliated Co-education institution created history by virtue of admitting a strength of 1100 students on roll in the very year of its inception with classes from KG to Std. VIII. It was indeed a beautiful history of destiny written by the Creator, which became a reality. 35 well qualified and experienced faculty pledged their commitment to the cause of the noble mission of teaching. Rev.Bro. Mariannan, the founder Principal of Montfort School, Kattur spared no effort in taking care of the enviable architectural master piece as well as the development of those under his care. He was at the helm from June 2006 - June 2011. His successor Rev. Bro. 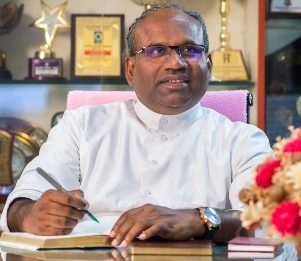 Dhanaraj, the former Provincial Superior of Trichy Province took over the reins and has hitherto been involved in the beautiful mission of education to live up to the lofty ideals and goals that underline the Montfortian vision and mission.